Welcome to our online community. To post a comment, you must be a registered user of RecipeTips.com. Log in to blogs, or register. Can you believe it? 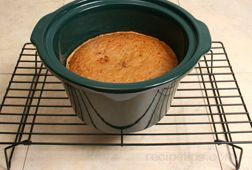 A delicious, moist carrot cake made in the slow cooker! Maybe that’s not such a surprise to many of you, but for me, a slow cooker seems a most unlikely appliance to use for baking. But, I tried it and it worked perfectly. One of our cooks at RecipeTips.com provided a helpful step-by-step demonstration (see "Slow Cooker Carrot Cake") that tasted every bit as good as an oven-baked version; in fact, I think it was probably better—it was definitely moist. I think the crock pot does a better job holding in moisture than just about any other cooking appliance. Simply combine all the ingredients, stirring until smooth, or use and electric mixer and beat the ingredients on high speed; then spread the frosting on the cake after it has cooled. Yum! I think it would be better to use a slow cooker liner bag rather than parchment paper because it would be easier to form it around the slow cooker. Parchment paper would probably work but because it is stiffer the outside of the carrot cake be a little rough looking. I wonder if this could be made using parchment paper to easily pull out the carrot cake when finished. I''ll have to try. The other day, I was browsing through recipes on RecipeTips.com trying to decide what to make with my abundance of garden vegetables. Some of us here in the Midwest have a common problem this time of year: We've got tomatoes coming out of our ears! It seems as though everyone with at least one square foot of open land or a flower pot on the back step has a tomato plant. Yes, another chicken recipe; and again, it's cooked on the grill. I know it might seem repetitious to write about another chicken recipe, but this time of year, I rarely get tired of trying different grilled chicken dishes. I think it would be better to use a slow cooker liner bag rather than parchment paper because it would be easier to form it around the slow cooker. I wonder if this could be made using parchment paper to easily pull out the carrot cake when finished. G would be my first choice but since I don't think that is going to happen I am going with F also. I have too many tomatoes to eat and give away so all the tomato information you have available is great.